After a stressful week for former emos, what with My Chemical Romance's teaser on Twitter – a date that seemed to imply a new album or tour, but was actually nothing of the sort, there's hope for rock fans from Avenged Sevenfold. The heavy metal group will tour the UK in January 2017. Their first UK tour since 2013's three-dater to celebrate their Hail to the King album reaching number one, they will take in cities across the country, including Glasgow, Newcastle, Sheffield, Manchester, Birmingham, Cardiff and Nottingham, before finishing up in London. Known for their 2005 breakthrough, City of Evil, and their self-titled 2007 album which reached number one on the Billboard Alternative, Hard and Rock charts, the group are renowned for their energetic live performances, and have also appeared as characters in Call of Duty Black Ops 2, for which they also wrote an original song, 'Carry On'. 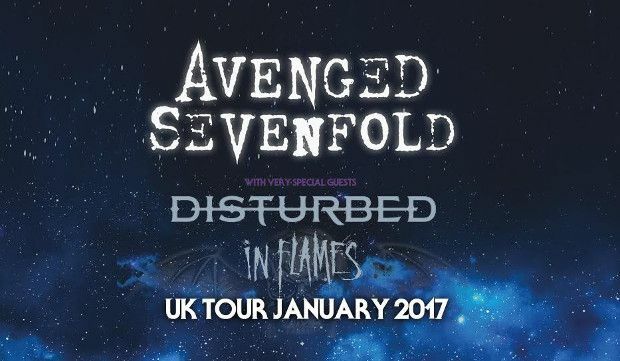 The tour will be supported by Grammy-nominated hard rockers Disturbed and death metal pioneers In Flames. General sale starts on Fri 29 Jul at 9am. Epic muscular metal quintet from Orange County.